Myths of duplicates and alter-egos have persisted for thousands of years… In Zoroastrianism, one of the world's oldest religions, the deity Spenta Mainyu is The Holy Spirit while his "evil twin" – Angra Mainyu – is the Destructive Spirit. In Ancient Egyptian mythology, a ka is a "spirit double" with the same memories and feelings as its counterpart. Native American folklore depicts an upper world where the good people reside and an underworld where their evil doubles dwell. Today, we refer to look-alikes as doppelgängers, a German word meaning "double-walker." When it comes to cinema, numerous iconic films have tackled the phenomenon, from Vertigo (1958), Persona (1966), and Dead Ringers (1988), to more recent movies like The Prestige (2006), Black Swan (2010), and Enemy (2013). Now, Academy Award winner Jordan Peele follows up his provocative 2017 horror-thriller Get Out with a definitive take on doppelgängers in Us. 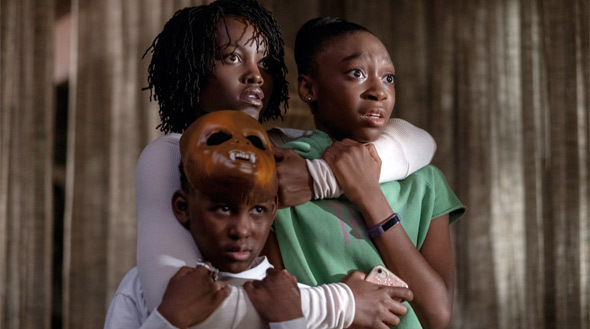 Opening in 1986, a young girl (Madison Curry) wanders off from her parents (Yahya Abdul-Mateen II and Anna Diop) during a visit to the Santa Cruz Boardwalk and finds herself in a spooky funhouse called Vision Quest – literally. While lost in the hall of mirrors, the girl suddenly discovers that what appears to be her reflection is, in fact, a doppelgänger of herself. Jump ahead to present day as Adelaide Wilson (Academy Award winner Lupita Nyong'o) reluctantly returns to Santa Cruz along with her husband, Gabe (Winston Duke from Black Panther), plus their two children Zora (Shahadi Wright Joseph) and Jason (Evan Alex), for a much-needed summer vacation. Haunted by the unresolved trauma of her past, Adelaide grows increasingly certain that something terrible is going to happen there. After spending a stressful day at the beach with their friends, Kitty and Josh Tyler (Elisabeth Moss and Tim Heidecker) and their twin daughters Becca and Lindsey (Cali Sheldon and Noelle Sheldon), Adelaide and her family return to their beach house to discover the silhouettes of four strangers standing hand in hand in their driveway. Only the strangers aren't strangers at all – they look just like the Wilson family. Dressed in matching red jumpsuits and a single right-handed brown leather glove, and armed with a pair of brass scissors, the doppelgängers – referred to as "The Tethered" – are intent on killing their doubles and taking their place. Written, directed, and produced by Peele, Us is an ambitious and thought-provoking follow-up to Get Out, with magnificently macabre shot compositions by Peele and cinematographer Mike Gioulakis (Glass, It Follows) and a fierce, double-edged performance by Nyong’o. On its surface, the film is a wildly entertaining thriller, but underneath that, Us is overflowing with subtext, making for an incredibly rich and rewarding experience for those who wish to dig deeper and unpack the film's thematic underpinnings. While Peele's Get Out confronted unspoken truths about race in America, Us takes on the entire country and all of its citizens. In American culture, we are often distrustful of those whom we perceive as being "them" rather than "us." The monster is from outside of ourselves; outside of our country's borders. As a result, we dehumanize them – we're less empathetic toward them, and we blame them for our problems as we are unable to recognize our own demons. Here, the outsider wears our face. The monster, though externalized, is within us – tethered to us. The middle-class American family at the heart of Peele's horror story is forced to confront a darker version of themselves. It's a fascinating exploration of what we've become as a country and how the most unspeakable horrors come from how we treat each other. There's symbolism everywhere in Us. The Tethered's weapon of choice, for example, is an extension of the film's theme of duality: two blades, laid one on top of the other and fastened in the middle – two parts, tethered. The use of scissors and shears as a murder weapon evokes iconic imagery from horror films like Alfred Hitchcock's Dial M for Murder (1954), The Burning (1981), Friday the 13th: A New Beginning (1985), Oldboy (2003), and Inside (2007). In the gloved hand of Red, Adelaide's doppelgänger, the scissors take on the appearance of Freddy Krueger's bladed glove from A Nightmare on Elm Street (1984). The allusions continue with the Tethered's work-wear jumpsuits, reminiscent of an escaped prisoner or patient like Michael Myers or Hannibal Lecter. Kudos to costume designer Kym Barrett (Cloud Atlas, The Matrix) and production designer Ruth De Jong (Twin Peaks: The Return) for building on what's come before while offering up something new, and equally iconic, to the genre. Of course, symbolism means nothing without an emotional connection. The Tethered are pretty much exact duplicates of the Wilsons, yet they are unique characters unto themselves, with their own way of moving and communicating. As a result, each actor is tasked with the challenge of playing dual roles: the person trying to save their own life, and the person trying to end it. Lupita Nyong'o delivers one of the all-time great "evil double" performances – think Dale Cooper from Twin Peaks – portraying Adelaide as the resilient hero and Red, her terrifying doppelgänger, as a supernatural entity that moves like a cockroach and "speaks" as if her vocal cords have been corroded by acid. Winston Duke and child actors Shahadi Wright Joseph, Evan Alex, and Madison Curry are great in their roles as well, but Nyong'o is absolutely the driving force. Without her, Peele's unsettling horror film isn't as affecting or entertaining. Funny, scary, and brilliantly executed, Us unquestionably solidifies Jordan Peele as one of the preeminent horror filmmakers of our time. Like George A. Romero, John Carpenter, and Wes Craven, Peele deals in big, esoteric concepts that allow for deep introspection without feeling like homework. He isn't a "spirit double," however, but entirely his own filmmaker, with a unique perspective who makes very personal films that feel like blockbusters. Us is a vital piece of American filmmaking that, like Get Out, will be discussed decades from now as one of the most relevant films of its time.